In the wake of the ‘new’ uprising and ‘new’ developments in Iraq, let’s examine the bottom line here once and for all. 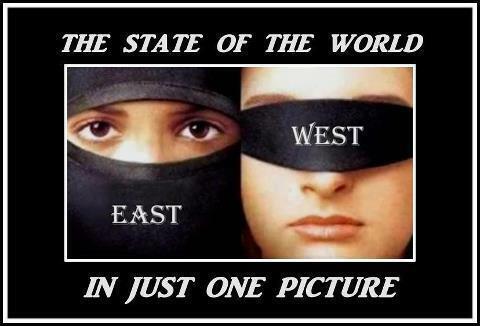 Anyone else out there sick and tired of this suicidal ignorance that labels our enemy anything but what it really is? The latest denial of the real enemy is this new label ISIS – Islamic State of Iraq & Syria. They are the ‘new’ bad boys in the Middle East and are bound to join the numerous other ‘groups’ on the Foreign Terrorist Organizations. Does anyone with any working brain cells ever think that there will be peace in the Middle East? Or that these terrorists will ever stop? This has been going on since Mohamed’s first mass murders and conquest in the name of ‘Allah’ some 1400 years ago. How many wars and how many young soldiers have to die before the West gets it? How many buildings and planes and trains and Hotels have to be blown up? And how many F__king ‘terrorist groups’ shouting ‘Allah Akbar’ will there be before the West’s suicidal mentality adds up ‘one plus one’ and finally gets ‘two’? Last week a radio host was interviewing a Muslim convert to Christianity who had recently written a book chronicling his conversion and the extreme measures he now must undergo to protect himself and his family from this “religion of peace.” What was noteworthy was the profound sentiment he expressed – America must use its military to go to every Muslim nation in the world and convert them to Christianity; it is the only way to end the Muslim jihad against the West, against Christianity and against civilization. Why don’t our politicians speak with such clarity and moral authority? Combining Coulter’s battle cry together with the Newtonian principle that to every action there is always an equal and opposite reaction, then should not America counter Muslims’ worldwide jihad against the West with an international comprehensive Christian conversion campaign? History has repeatedly demonstrated that in the end either Muslim terrorists and Islam will destroy America, and Christianity, or American’s will stand strong and true and kill those who are killing us. A conversion policy will obviate the need for perpetual nation building. To the shores of Tripoli refers to the First Barbary War, and specifically the Battle of Derne in 1805. Muslims never forget their history (nor should Americans), which is why Islamic terrorists are killing Christians and destroying churches on a genocidal scale even in Iraq and Afghanistan – countries we supposedly liberated for “democracy.” This policy of nation-building has been a big sham perpetrated by Democrats, Republicans and war contractors and must be replaced with a policy of Christian-building. What makes America exceptional is our intense love of liberty and freedom including the freedom to worship God according to the dictates of one’s own conscience. History has shown that when given a real choice, most people choose Christianity. The Obama administration plans to allow women to fight on the front lines. This concession to the feminist movement will only further erode military readiness, cohesion and morale. All of these liberal policies regarding military reform are nihilistic and solely designed to accomplish one thing – destroy the greatest fighting force in the history of humanity so as to be fair with all the other nations of the world. In other words, it follows classical progressive revolution tactics of egalitarianism – the equalization of misery upon everyone (except the oligarchy that runs the government). I came across an interesting video called, “6 million Muslims convert to Christianity.” Despite their existential jihad against Christianity and the West, their murderous plans have had an opposite effect, multiplying the number of Christian converts exponentially – 16,000 per day, 6 million per year and growing. The Bible said of the early church: “The more they persecuted them [Christians] the more they grew.” And remember the first-century church faced such megalomaniacal emperors as Domitian, Tiberius, Nero and Caligula. By the early fourth century the power of Christianity moved Emperor Constantine to make Christianity the official religion of the Roman Empire. If America is really serious about combating worldwide Islamic terrorism and the increasing reports of Christian genocide among the 44 Muslim nations, then let us take up the battle cry of Ann Coulter and the Muslim author who converted to Christianity and train our military not only to kill and destroy our enemies but to convert them to Christianity. What good is it to a nation to fight perpetual wars against Muslims and Islamic terrorism and spend over a trillion dollars in war costs and nation-building if the day we leave Iraq and Afghanistan the murderous thugs of al-Qaida and the Taliban not only seize hegemony, but become emboldened and metastasize into an even greater menace against neighboring Muslim countries who utterly hate Christianity, America, democracy, Israel and Western civilization? My one revision of Coulter is not that we should invade their countries: “We must invade their countries, kill their leaders and convert them to Christianity. PC (perversity correctness) means keeping Christianity, America and the West on the road to dhimmitude. Six million Muslims convert to Christianity per year. Thank God Christian missionaries are still devoted to Christ’s mandate: Go ye therefore, and make disciples of all the nations, baptizing them into the name of the Father and of the Son and of the Holy Spirit.